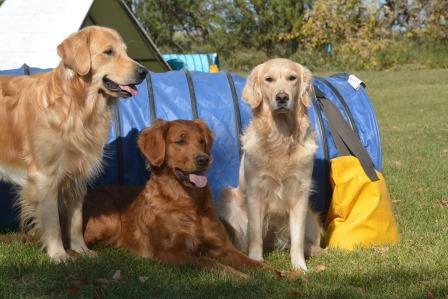 At Charmlee Goldens we strive to produce structurally and mentally sound Golden Retrievers who can do any job asked of them as well as be great family pets. All of our own dogs are members of our family first. Adult and puppies are born, raised and live in the house, underfoot and hogging the bed. They are welcome to come with us everywhere we go from work to family outings. Our dogs also train and compete in many different activities. They are breeder/owner trained and handled to titles in agility, draft dog, hunt tests, obedience trials, rally obedience, tracking and working certificate tests. They also love sledding to keep in shape over the Saskatchewan winters. Unfortunately work commitments keep us from getting out hunting as much as we'd like but the dogs love it when we do. Please look around our site to meet our dogs, learn more about the breed, see some candid just for fun picures, the latest news at Charmlee and the occasional litter announcement.